Mainstream media went crazy over the first 3D printed gun, the Liberator by Cody Wilson’s Defense Distributed. Though it’s plastic it was demonstrated to fire multiple rounds before becoming inoperable. Other makers went on to improve the durability of the design, but ultimately it’s still made of the same ABS plastic that Legos are made of, so it can only be so tough. 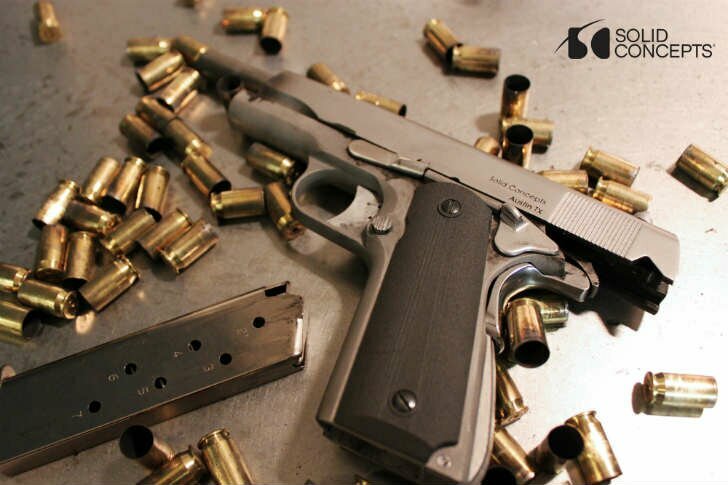 That is not the case with the metal 3D printed Model 1911 pistol that SolidConcepts printed. Basically, “If we can print a working gun, what can’t we print?” And it does work. Over 600 rounds have gone through it with only one minor issue related to design and not the printing. There was no machining or milling done, only some hand sanding that’s typical with metal prints. So how much of it was printed? “34 parts were created with metal sintering, 2 parts were created with laser sintering of Nylon 12 CF (carbon filled Nylon), and only 6 springs were retail purchased.” Everything but the springs. It’d take a well-trained eye to even see that it’s 3D printed. This is not a cost-effective way to produce guns, but that’s not what this project was about. The gun is not currently for sale, but SolidConcepts said it’d be in the five-figures if they do decide to sell it. But they proved their point; they can print metal parts with reliability, usability, durability, heat tolerance, and accuracy. Of course, they are in talks with gun manufacturers and surely the military will love to get this technology into the field.